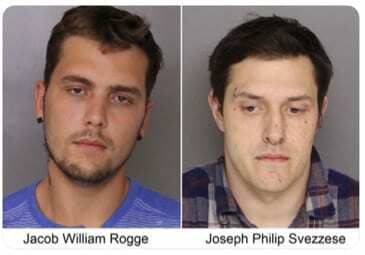 Jacob William Rogge, 28, of the 7900-block of Bradshaw Road (21156), has been charged with armed robbery, robbery, first- and second-degree assault, theft, and destruction of property after robbing a High’s store located on Long Green Pike at around 5 a.m. on Saturday morning. 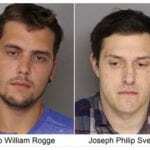 Rogge was dressed in a full-body, white and pink unicorn costume and wielding a crow bar, which he used to smash one of the registers when he demanded money from the employee. 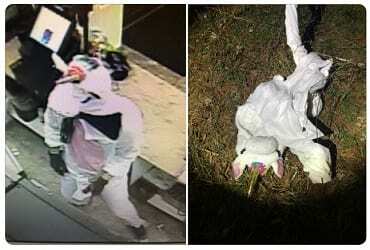 The photo released by police shows Rogge in the unicorn costume as well as the discarded costume found by the side of the road after their vehicle crashed.